On the hunt for locally-sourced ingredients so you can cook mouthwatering meals at your campsite on your next road trip’ Here’s a roundup of 8 Fantastic Farmers’ Markets in Canada so you can create your own little farm-to-fork food odyssey across our beautiful (and delicious!) country. Get ready to graze in the great outdoors! Goats on a roof’ True story. What started as a fruit stand on the side of the highway in the early 1970s is now a year-round market and one of the island’s top tourist destinations, complete with small flock of goats on the grassy rooftop ‘ ‘natural lawn-mowers’, if you will. The Old Country Market in Coombs features a wide selection of produce, deli items, international foods, baked goods, gifts and ice cream! It’s a family-friendly pit stop with a few photo opps, for sure. Nearby RV-friendly campsites: Coombs Country Campground, Paradise Sea-side Resort, plus more listings here. In the heart of Grizzly Plaza, the seasonal Revelstoke Farm & Craft Market is a quick detour off the Trans-Canada Highway. It’s a great place for a Saturday stroll to pick up some local produce, meat for the grill, fresh flowers and perhaps a souvenir from a local artisan. While you’re at it, soak in the panoramic mountain views and the charming heritage buildings in downtown Revelstoke. Nearby RV-friendly campsites: Lamplighter Campground, Canada West RV Park plus more listings here. A great pit stop for provisions, the Millarville Farmers’ Market is nestled in the beautiful Alberta countryside (southwest of Calgary) and celebrates ‘knowing your farmer, baker and candlestick maker!’ Located next to the Millarville Racetrack, the market is home to numerous local vendors of fresh fruit and vegetables, meats, baked goods, ready-to-eat finds and artisan crafts. Check out what’s in season for the region at this seasonal hub (Saturdays, mid-June through early October) for fresh local fare, kiddo-friendly events and a warm welcoming community. While you’re in the neighbourhood, explore the nearby small towns of Black Diamond and Turner Valley. And if you’ve really fallen in love with the area, rustic unserviced camping facilities are available on a first-come basis in the treed area just steps away from the market. Nearby RV-friendly campsites: Nature’s Hideaway Family Campground, Beaver Flats Campground plus more listings here. With a ‘make it, bake it, grow it’ motto that runs deep in its 25+ year history, Le Marché St. Norbert Farmers’ Market is the largest farmers’ market in the province of Manitoba. This indoor/outdoor farmers’ market is located just off the Pembina Highway in Winnipeg. With more than 100 local vendors to choose from, you’re sure to bring home a pretty great haul from the market to cook up an amazing feast! Nearby RV-friendly campsites: Town & Country Campground, Winnipeg West KOA plus more listings here. 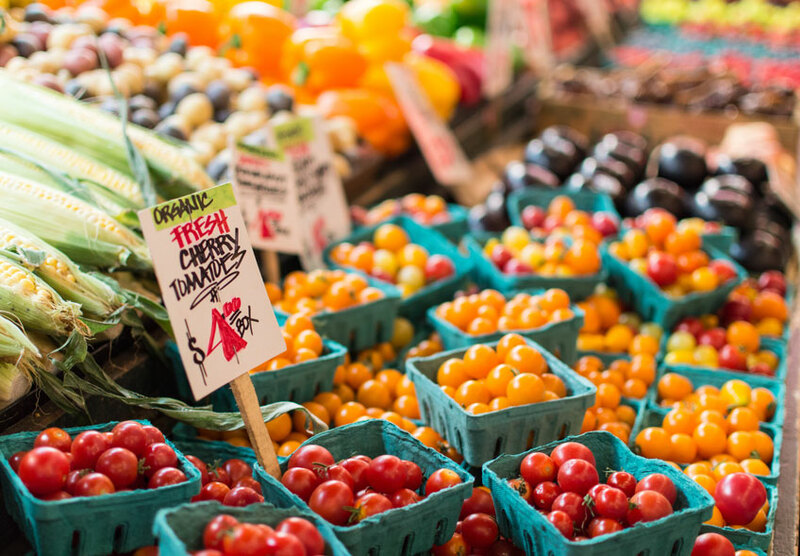 With weekly local fare from hundreds of local vendors ‘ from food to flowers to furniture ‘ the bustling St. Jacob’s Farmers’ Market is Canada’s Largest Year-Round Farmers’ Market. This indoor/outdoor market near Waterloo, Ontario features a delicious bounty of fresh food galore ‘ including grass-fed and gluten-free options ‘ to fuel your adventures! Nearby RV-friendly campsites: Green Acre Park, Country Gardens RV Park plus more listings here. Nestled in the Laval countryside, Ferme Turcot is a family farm that also runs a fresh fruit and vegetable stand roadside in the warmer months (mid-June through early October). Berry picking at the strawberry patch makes for a fun family-friendly activity in summertime. If you’ve got a sweet tooth, keep a lookout for the dessert pies! Nearby RV-friendly campsites: De La Montagne D’Argent, Au Plateau 5 Étoiles plus more listings here. Heading to Nova Scotia on your next RV trek’ A cozy 4H barn is home to the Antigonish Farmers’ Market, open May through December. Celebrating more than 20 years in operation, this community-based farmers’ market celebrates local food, craftsmanship and entertainment. Nearby RV-friendly campsites: Whidden’s Campground, Linwood Harbour Campground plus more listings here. If your RV travels take you to the Gentle Island, Charlottetown is a great hub to grab local ingredients for your beach-side adventures. The Charlottetown Farmers’ Market is a local favourite on Saturdays (year-round) and Wednesdays (seasonal) for the community to gather and support farmers, producers and artisans from across the province. If you’re too lazy to cook, the market also features some delicious ready-to-eat options and picnic table seating for you and your crew. Nearby RV-friendly campsites: Cavendish Sunset Campground, Twin Shores Camping Area plus more listings here. Feel free to share your tips on your favourite pit stops for local camping ingredients with our #GoRVingCanada community. Connect with us on Facebook, Twitter or Instagram. Happy travels!